We are excited to announce that on May 6, 2014, Outside the Lens will be participating in GiveBIG 2014, a 24-hour day of giving to increase philanthropy in San Diego and raise awareness and support for local nonprofits, including OTL! The funds we raise during this campaign will provide scholarships to OTL Summer Camps for youth in need. Presented by The San Diego Foundation and its media partners, San Diego Magazine and San Diego 6 television, giveBIG will take place on Tuesday, May 6, 2014 from midnight - 11:59 p.m. PST. During this time, please visit www.giveBIGsandiego.org and donate to Outside the Lens, and encourage others to do the same! Every dollar donated to Outside the Lens through giveBIG on May 6 will go further because of the incentive pool that has been created by The San Diego Foundation and its sponsors. In conjunction with US Bank and The Waitt Foundation, The San Diego Foundation has pooled $150,000 to incentivize giving during this event, so that we receive a proportion of this pool based on how much money we raise during the event. For example, if OTL raises 5% of the total amount raised during the event, we will receive 5% of the incentive pool. Outside the Lens Summer Camps are an amazing enrichment experience for 3rd - 12th grade students: an opportunity to go in-depth into the photography/digital media topic of their choice, create awesome projects, work closely with our professional arts and media educators, exhibit their work at OTL's gallery at the end of the summer, meet new friends and have fun! We want to make this opportunity available to as many students as possible and are excited for GiveBIG on May 6 to make that happen. Post about the event to your social networks (Facebook, Twitter, Linked In), and make sure to tag @OutsidetheLens and #GiveBIG in your posts! Thank you - our work would not be possible without the incredible support we get from you! 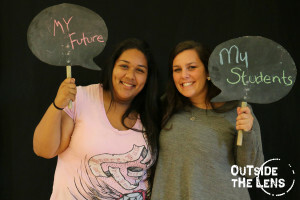 Kristen, OTL Student (left) and Sloan, OTL Media Educator (right) tell the world what they care about.